The Arkansas Inland Maritime Museum is located in North Shore River walk Park along the north shore of the Arkansas River in North Little Rock, Arkansas. Hosting more than 100,000 guests from all 50 states and 77 foreign countries, the Museum, is most recognized for featuring the longest-serving submarine in the world. There is also a Peace Garden for the community to celebrate the ideal of peace in this war-torn world. 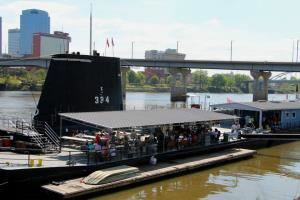 The museum is available for birthday parties, group tours, school field trips, submarine sleepovers, and corporate events. The package includes: • Guided tour of the submarine for 10 people • Use of the facility for 2 hours • Gift for the guest of honor • Soft drinks • Complimentary Paper Goods Please visit our website for complete package details. Birthday celebration fees do not include state, county, or city sales taxes. The package includes: • Guided tour of the submarine for 20 people • Use of the facility for 2 hours • Gift for the guest of honor • Soft drinks • Complimentary Paper Goods Please review our website for complete package details. Package includes: • Guided tour of the submarine for 30 people • Use of the facility for 2 ½ hours • Gift for the guest of honor • Soft drinks • Complimentary Paper Goods Please visit our website for complete package details. The Arkansas Inland Maritime Museum hosts various special events at the facility such as Corporate Dinners, Wedding Receptions, and Fundraisers. Special events can be scheduled Wednesday through Saturday, outside of normal operating hours. The event space includes our lobby area with inside dining space and a covered patio for outside dining space. The cost is $100 an hour for a minimum of 4 hours. A $100 non-refundable deposit is required within 7 days of scheduling the event. Events must be scheduled at least 7 days in advance and are subject to prior bookings. Special Event fees do not include state, county or city sales taxes.